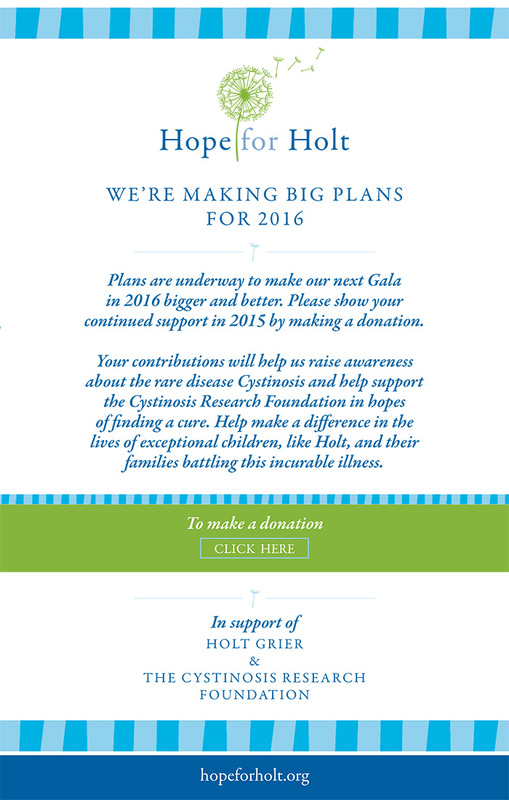 Holt Grier was barely a year old in 2007 when he was diagnosed with Cystinosis. His family and friends have created this foundation to raise awareness about the rare disease and help support the Cystinosis Research Foundation in hopes of finding a cure. Cystinosis is a rare, inherited, metabolic disease that slowly and eventually destroys all major organs of the body including the kidneys, liver, eyes, muscles, bone marrow, thyroid and brain. Holt is one of only 500 in the US and 2000 worldwide to be affected with the disease. Although medication is available to control some of the symptoms of this insidious disease, Cystinosis remains incurable. For more information and to see the challenges the family faces each day please read Jason Grier's blog at http://griertown.blogspot.com/. Rare diseases have less awareness, therefore less funding. The only way real progress is made is through the private funding of research. Please find out how you can help make a difference in the lives of exceptional children and their families battling this incurable illness.